KristineResendes.com: Nao Fall for it! Ben & Jerry's Newest Launch! Nao Fall for it! 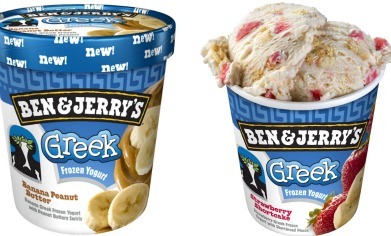 Ben & Jerry's Newest Launch! It's made with a thick, strained Greek yogurt base and has four flavors: Peanut Butter Banana, Raspberry Fudge Chunk, Strawberry Shortcake and Blueberry Vanilla Graham. Using Greek yogurt makes this frozen treat creamier than your average fro-yo, but there's only a hint of tanginess. The flavors are all about 200 calories per 1/2 cup serving, compared to Chubby Hubby's nearly 400 calories per serving. The raspberry with fudge similar to its cousin Cherry Garcia, and the banana and peanut butter is kind of like Chunky Monkey. It might be half the calories, but it could still be ALL THE GUILT. Not to be a downer guys, because I would probably eat this, but I looked up the ingredients. Although it doesn’t claim to be organic, it does want people thinking is free game for you hard working dieters! There ARE directly great ingredients, such as bananas, but wherever you see “Natural Flavor” you need to really think of the integrity of the brand. There are no regulations for “Natural Flavor” and more often then not they are not good. There is also juice concentrate in there too, which we all know is not very healthy. Anyway, this is a personal call. I sometimes look too hard at the label and at other times ignore the same ingredients I’m pointing out to you now. Ingredients: Skim Milk, Greek Yogurt (Cultured Skim Milk, Natural Flavor, Carrageenan), Liquid Sugar (Sugar, Water), Cream, Sugar, Water, Peanut Butter (Peanuts), Bananas, Corn Syrup Solids, Egg Yolks, Corn Oil, Nonfat Yogurt Powder (Cultured Nonfat Milk), Lemon Juice Concentrate, Locust Bean Gum, Salt, Natural Flavors.